Jan 04, 2016 You deciding to choose 50 Floor in conjunction with the posting of this review is greatly appreciated. 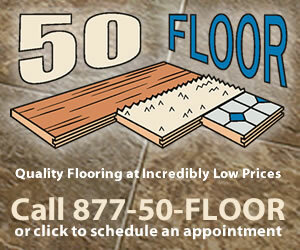 50 Floor offers hundreds of products from numerous distinguished manufacturers for several flooring types. The manufactures supply warranties on all purchased products. Several of the manufacture warranties are valid for a lifetime for the specific product and 50 Floor provides a Gold Star warranty for the completed installation making required improvements easy to accommodate. I desire the chance to speak with you so I may supply you with the helpful information as well as further assist you in any way possible. We had 50 Floor install hardwood in our living room, dining room, kitchen, laundry room, stairs and hallway early this year. The salesman said it will take at least one week to remove the original hardwood and carpet and install the new hardwood floor, but it took them only 2 days. They were super fast - no quality in their work. 50 Floor uses SUB, SUB standard hardwood floors from Armstrong. 70-80% of the wood they installed had defects - cracked. The installers like putting lots and lots of nails and then they try to cover the nail heads with putty. There are gaps that are anywhere from 1-2 cm. that they fill with putty. When we complained, they said the installer who installed our floor was the best they have. The wood they installed on our stairs was unfinished. The installer stained the wood and only put 1 coat of polyurethane. I had to fight them to put another coat of poly. They smeared the stain on the walls and risers, then they told us that they were not responsible for cleaning this mess. This was also true with the 1/4 round moldings. DO NOT hire 50 Floor. I didn't like: Materials, Installation, Unsatisfied, Deplorable customer service. Review #676730 is a subjective opinion of User676730. So glad I read these reviews I saw them on TV I was planning on getting them to install hardwood on my stairs, bedroom and dining rooms. Their ad is so misleading according to the reviews I just finished reading. I can't thank you enough for your reviews.